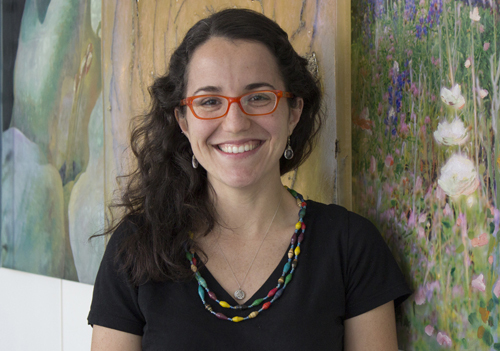 The University of Texas Graduate School of Biomedical Sciences at Houston would like to congratulate neuroscience Ph.D. student Sahily Reyes for being named an Albert Schweitzer Fellow at The University of Texas Health Science Center at Houston. Her advisor is GSBS Associate Dean of Graduate Education and Professor Andrew Bean, Ph.D.
For her project, Reyes is working with families whose children attend Jefferson Elementary School in the Houston Independent School District. Students at this school, as well as their families, face significant health challenges such as poor access to healthcare, nutritious food, and a high risk for chronic illnesses like diabetes and hypertension. After meeting with some of the mothers from the community, they expressed interest in activities that made them more physically active and that decreased their risk for chronic diseases that commonly affect Hispanic communities in this city. “Whenever I visit Jefferson, I see a community coming together to overcome. I am inspired by their resilience and feel honored to be working alongside them to find solutions to some of their health concerns,” said Reyes. Reyes plans to carry out weekly interventions throughout the school year and in addition to a fitness class, is proposing holding interactive lessons/discussions on obesity and chronic diseases. Her project will start with a launch party on Thursday, October 13, and will continue until March 2017. The Albert Schweitzer Fellowship Houston Galveston is a non-profit organization, with headquarters at Baylor College of Medicine, that offers graduate students the opportunity to design and implement a health-related, 200-hour, year-long community project that provides direct service to an underserved population. Students are paired with mentors, field experts, and community sites to meet vital local health needs, with an immediate and lasting impact in the Houston-Galveston area. Since 2008, over 100 Albert Schweitzer Fellows in Houston-Galveston have completed projects in areas such as HIV/AIDS care, homeless support, oral health, nutrition, refugee health, mental health awareness, mobile health clinics, smartphone health apps, family and teen support groups, healthcare education and more.